The BioScience Network Lausanne and the SV postdoc association are organizing a company visit at Syngenta on the 7th of October (Friday) 2016 in Basel. The aim of this visit is to promote interactions among researchers in industry and PhD students and postdocs from EPFL and UNIL. In attachment you will find the final schedule for the visit!! !! Registration deadline is in 1 week. Do not miss this great opportunity !! Since the Syngenta company is not well connected with public transportations, a bus will be provide and the cost is 60 CHF per person. The registration is now open and the deadline is the 27th of September 2016, 12:00. Places are limited to 20 participants, so register early! The organising committee will select participants based on their CV and a small paragraph about their motivation. The results of the selection will be communicated by September 30th, 2016. Send an email to bsnl.lausanne@gmail.com with the proof of payment.
! Registration opens now and closes on the 27th of September 2016 at noon! In case you have any questions, don’t hesitate to contact us. MedLem Meeting “INFLAMMATION in the era of BIG DATA” the 17th of November 2016 in Geneva-Centre Louis Jeantet. « INFLAMMATION in the era of BIG DATA ». 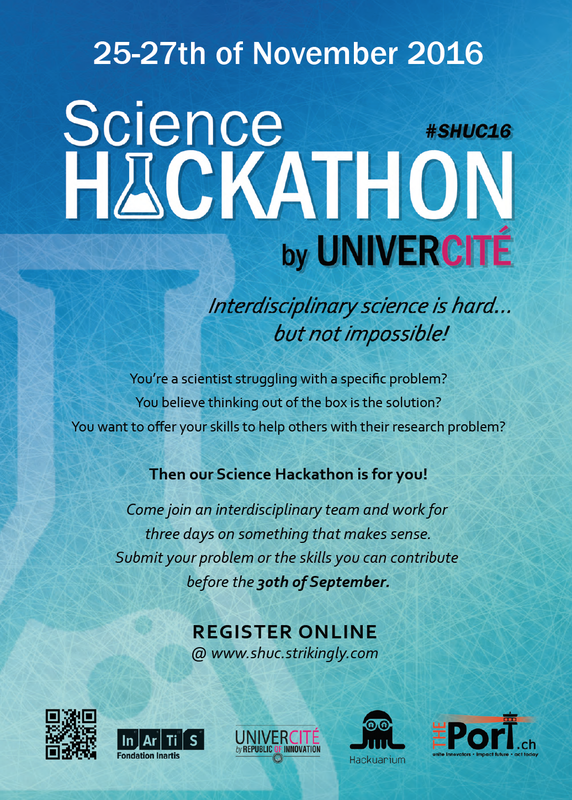 Friday 25th, Saturday 26th and Sunday 27th of November, Hackuarium with Inartis Foundation and THE Port association organise a Science Hackathon at UniverCité! So if you have a science project, a problem or some skills you want to share with a team of 25-30 other bright minds, sign-up HERE before September 30th! It will be 3 days of intense brainstorming, prototyping and problem solving. Everyone welcome! And please, spread the word! María Rodríguez Martínez, Technical Leader of Systems Biology at IBM, Zurich Research Lab, on Wednesday the 7th of September 2016 at 18:00 at UZH, Irchel campus, Y03-G91. Abstract: Despite their great promise, high-throughput technologies in cancer research have often failed to translate into major therapeutic advances in the clinic. One challenge lies in the difficulty of transforming next generation molecular data into mathematical disease models that can make actionable clinical statements. A second challenge arises from the high level of intra-tumor heterogeneity exhibited by most human cancers. To address these challenges new methodologies that can reconstruct the map of genomic alterations and understand its influence on phenotype need to be developed. In this talk I will give an overview of current projects at the Systems Biology group in IBM Research, Zurich, that illustrate systems medicine approaches to understand cancer complexity and that can bridge the chasm between basic research and clinical applications. The talk will be followed by an apéro, during which participants will have the opportunity to continue discussions with María Rodríguez Martínez.